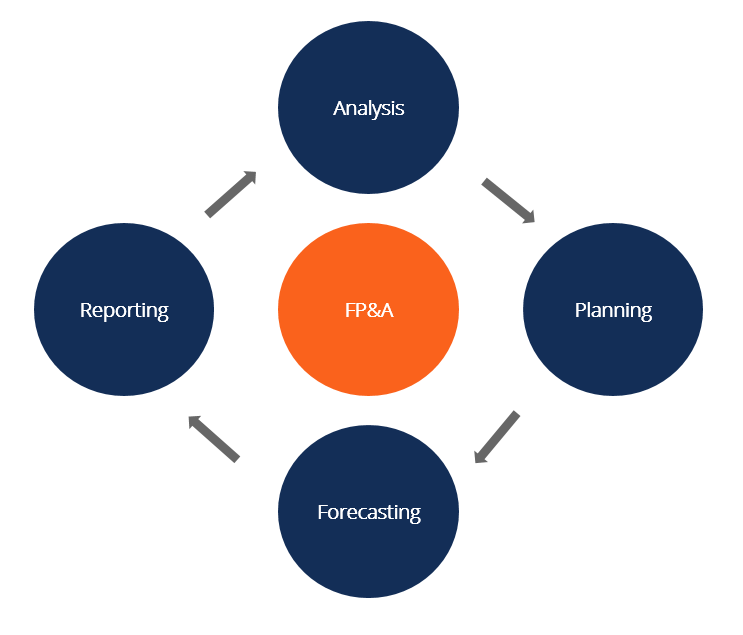 FP&A - What Do Financial Planning and Analysis Teams Do? What is Financial Planning and Analysis (FP&A)? Very few, if any, companies can be consistently profitable and grow without careful financial planning and cash flow management. The job of managing a corporation’s cash flowCash FlowCash Flow (CF) is the increase or decrease in the amount of money a business, institution, or individual has. In finance, the term is used to describe the amount of cash (currency) that is generated or consumed in a given time period. There are many types of CF typically falls to its FP&A team and its chief financial officer (CFO). Read more about the role of the CFOWhat Does a CFO DoWhat does a CFO do - the job of the CFO is to optimize a company's financial performance, including: reporting, liquidity, and return on investment. Within a company, these responsibilities fall into departments typically known as the controller's group, treasury, and financial planning and analysis (FP&A). Corporate financial planning and financial analyst professionals utilize both quantitative and qualitative analysis of all operational aspects of a company in order to evaluate the company’s progress toward achieving its goals and to map out future goals and plans. FP&A AnalystsFP&A AnalystBecome an FP&A Analyst at a corporation. We outline the salary, skills, personality, and training you need for FP&A jobs and a successful finance career. FP&A analysts, managers, and directors are responsible for providing executives with the analysis, information they need to make operational, strategic decisions consider economic and business trends, review past company performance, and attempt to anticipate obstacles and potential problems, all with an eye toward forecasting a company’s future financial results. FP&A professionals oversee a broad array of financial affairs, including income, expenses, taxes, capital expenditures, investments, and financial statementsThree Financial StatementsThe three financial statements are the income statement, the balance sheet, and the statement of cash flows. These three core statements are intricately linked to each other and this guide will explain how they all fit together. By following the steps below you'll be able to connect the three statements on your own.. Unlike accountants who are in charge of recordkeeping, financial analysts are charged with examining, analyzing, and evaluating the entirety of a corporation’s financial activities, and mapping out the company’s financial future. To learn more, launch CFI’s FP&A courses! Considering opportunities for the company to expand or grow. Mapping out growth plans, including capital expenditures and investments. Generating three- to five-year financial forecasts. In the end, a company’s financial analysts are expected to provide upper management with analysis and advice regarding how to most effectively utilize the company’s financial resources to increase profitability and grow the company at an optimal rate, while avoiding putting the company at serious financial risk. Good financial analysts are individuals capable of handling and intelligently analyzing a mountain of different types of data and data evaluation metrics. Financial analysts are good problem solvers. They are able to decipher the various puzzle pieces that constitute a company’s finances and envision putting the pieces together to formulate a variety of possible growth scenarios. If you just don’t like math or working with spreadsheets like Excel, you may want to consider an alternate career choice. But if you’re a creative problem solver, with a natural or cultivated talent for financial analysis, modeling, and forecasting, then becoming a corporate financial analyst may be the perfect career choice for you. To see if a financial planning and analysis career is right for you, explore our interactive Career Map. People who excel at the work of analyzing corporate finances and accurately identifying what financial moves a company should make in order to be optimally successful in an ever-changing marketplace are well paid for their skills. Entry-level junior analysts command annual salaries in the neighborhood of $50k. Senior analysts can see a salary up to $100k, usually combined with potential bonuses of 10-15%. A financial planning and analysis manager or director, and the chief financial officer (CFO) at a major, multi-national company typically rake in somewhere between six and seven figures in salary, supplemented with sizable performance bonuses. Compensation in the financial analysis field varies substantially between different industries and companies. Obviously, larger companies with larger profits can afford to pay more than a smaller company whose total net profit might not even reach seven figures. Positions in corporate finance are projected to see annual job growth upwards of 20% through the mid-2020s. To learn more, see our FP&A career profileFP&A AnalystBecome an FP&A Analyst at a corporation. We outline the salary, skills, personality, and training you need for FP&A jobs and a successful finance career. FP&A analysts, managers, and directors are responsible for providing executives with the analysis, information they need to make operational, strategic decisions. Although financial analysts have to evaluate a number of complex financial options and scenarios, they must also be capable of making firm decisions, able to avoid having a vast array of financial choices paralyze them into indecision. The desire to continually learn is an important personal strength for financial analysts. As businesses, markets, and economies change and adapt, so, too, must analysts continually change and adapt. In addition to honing financial skills and strategies, they are required to stay on top of business, industry, and economic trends. The best analysts are constantly learning more, becoming better and better at what they do. Corporate financial planning and analysis professionals are a group that has to be able to read and truly understand a company’s financial statements – balance sheetsBalance SheetThe balance sheet is one of the three fundamental financial statements. These statements are key to both financial modeling and accounting. The balance sheet displays the company’s total assets, and how these assets are financed, through either debt or equity. Assets = Liabilities + Equity, cash flow statementsCash Flow Statement​A Cash Flow Statement (officially called the Statement of Cash Flows) contains information on how much cash a company has generated and used during a given period. It contains 3 sections: cash from operations, cash from investing and cash from financing., income statementsIncome StatementThe Income Statement (or Statement of Profit and Loss) shows performance from operations of a business. The financial statement begins with revenues and, and in the case of public companies, shareholders’ equity statements. A good analyst not only understands the meaning and implications of each individual financial statement, but also sees the larger picture of how a company’s total financial position is reflected by the combination of assets, liabilities, cash flow, and income. A company’s financial analysis department needs to have an equal, if not better, grasp of accounting journal entriesJournal Entries GuideJournal Entries are the building blocks of accounting, from reporting to auditing journal entries (which consist of Debits and Credits). Without proper journal entries, companies’ financial statements would be inaccurate and a complete mess. and financial reconciliation statements than the accounting department does. Analysts have to understand the interrelated aspects of debits and credits, and be able to calculate and evaluate key financial ratiosProfitability RatiosProfitability ratios are financial metrics used by analysts and investors to measure and evaluate the ability of a company to generate income (profit) relative to revenue, balance sheet assets, operating costs, and shareholders' equity during a specific period of time. They show how well a company utilizes its assets in order to determine where the company stands financially, and how best to move forward from there. To learn more, explore CFI’s financial analysis courses! Financial analysts are also financial planners. Their purpose is to, based on research, data collection, and data analysis, advise a company’s management on the most financially efficient means of growing the company’s business and profits. In putting together reports such as three-year and five-year financial projectionsProjecting Income Statement Line ItemsWe discuss the different methods of projecting income statement line items. Projecting income statement line items begins with sales revenue, then cost of goods sold, gross profit, selling general and admin (SG&A), depreciation, amortization, taxes, EBITDA, and net income. This guide has examples, financial analysts are, in essence, constructing financial projects. Good financial analysts often bring to the table good project management skills, such as leadership, cost and time management, the ability to delegate, communication skills – and overall problem-solving skills. Most financial analysts are well-schooled in using programs such as Microsoft ExcelExcel ResourcesLearn Excel online with 100's of free Excel tutorials, resources, guides, cheat sheets, and more! CFI's Excel resources are the best way to learn Excel on your own terms. These guides and articles teach spreadsheet formulas, shortcuts, and functions step-by-step with screenshots, templates, lessons, guides, and more to create and analyze reports. Performing corporate financial analysis includes doing a great deal of data collection and data consolidation, and then generating numerous reports with lots of variables. A lot of the work of financial analysis involves examining key financial metrics, such as profit margins, sales volume, and inventory turnover, and then utilizing the analysis to create strategic financial planning to move the company forward to the next level of profitability. Analysts, managers, directors, and other members of the FP&A team frequently perform substantial financial modelingWhat is Financial ModelingFinancial modeling is performed in Excel to forecast a company's financial performance. Overview of what is financial modeling, how & why to build a model. A 3 statement model links income statement, balance sheet, and cash flow statement. More advanced types of financial models are built for valuation, plannnig, and work, including creating, updating, and managing the company’s corporate model in Excel. The corporate model is used for consolidating the budgets for all departments, creating long-term forecasts, and measuring actual results against forecasts. 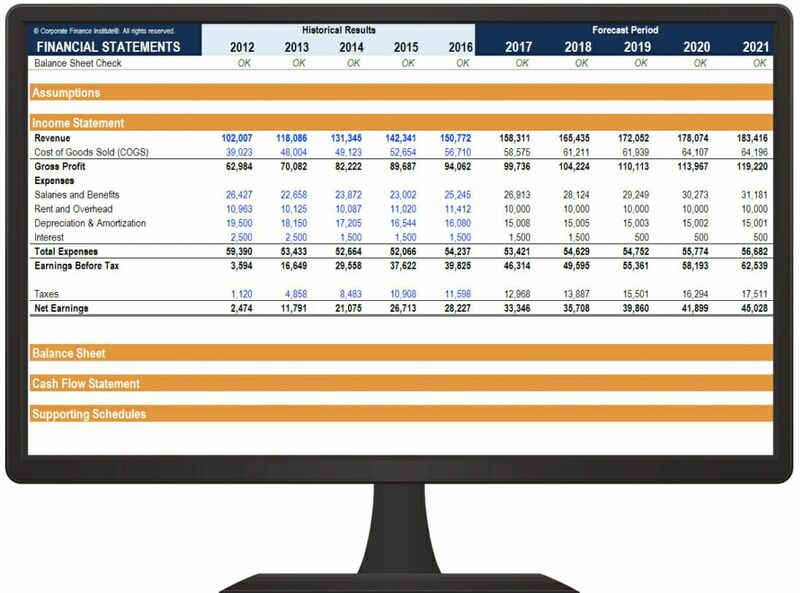 The output of the financial model may be used in dashboardsDashboard Creation in ExcelThis guide to dashboard creation in Excel will teach you how to build a beautiful dashboard in Excel using data visualization techniques from the pros. In order to create an effective Excel dashboard, follow these steps: organize your data, setup your page, brainstorm, select visuals, focus attention, tell a story, investor relationsInvestor Relations ManagerAn Investor Relations Manager has the responsibility of bridging the communication gap between a company’s corporate management and its investors. An Investor Relations Manager helps support releasing information, handling inquiries and meetings, providing feedback to management, crisis management, analyst meetings presentations, board reporting, and ad-hoc analysis. Below is an example of a financial model used in FP&A. Learn more about financial modeling as it applies to financial planning and analysis careers. Aspiring corporate financial analysts can follow a number of educational paths to success in the industry. Degrees commonly held by analysts include accounting, business administration, statistics, and finance. The logical post-graduate course of study for financial analysts is an MBA degreeIs an MBA worth it?If you're thinking of going to business school you may be asking, is an MBA worth it?. The answer (as in every MBA class) is: "it depends". Other than the workload of doing an MBA, there is almost no reason not to do an MBA if your boss is paying for it. They may use it as leverage against you and lock you in, but the ROI is incredible if it's free (obviously)..
CFI offers professional FP&A courses, along with continuing education training, all online. Having a certification from CFI helps with landing jobs, securing promotions, and being able to command higher levels of compensation. Some corporate financial analysts also seek professional certification in the arena of investing, obtaining credentials such as Certified Financial Planner (CFP), Financial Risk Manager (FRM), or Financial Modeling and Valuation Analyst (FMVA)FMVA™ CertificationThe Financial Modeling & Valueation Analyst (FMVA)™ accreditation is a global standard for financial analysts that covers finance, accounting, financial modeling, valuation, budgeting, forecasting, presentations, and strategy. . Explore all CFI courses now to start advancing your career! The best practical work experience outside of direct financial analysis work is anything that shows you’ve demonstrated the ability to help a company grow, especially in a cost-efficient manner. That might be anything from boosting sales by doing a good window display, to reducing overhead costs through a total revamping of a company’s inventory system. Virtually any general business experience that highlights your ability to solve problems and increase profitability can be a major plus on your resume’ when applying for work as a corporate financial analyst. Working at a bank or at a public accounting firmMapInteractive Career Map - discover your career path in corporate finance. Learn which job is right for you: salary, personality, skills, certifications etc. can be a great way to get into FP&A. In a small business, the position of the corporate financial analyst may not exist as a separate job title, but instead effectively be held by the owner, CEO, CFO, or company controller. Larger companies have a complete corporate financial analysis department, usually headed by either a director of financial planning and analysis or by the company’s Chief Financial Officer (CFO)What Does a CFO DoWhat does a CFO do - the job of the CFO is to optimize a company's financial performance, including: reporting, liquidity, and return on investment. Within a company, these responsibilities fall into departments typically known as the controller's group, treasury, and financial planning and analysis (FP&A). Some companies have both positions, with the director of financial analysis reporting to the CFO. In a large corporate financial analysis department, entry-level junior financial analysts work in small groups headed by a senior financial analyst. In the largest, multi-national firms, junior analysts are assigned to evaluate a single product line, or perhaps even a single product. For example, if you worked as a junior analyst at The Hershey Company (NYSE: HSY), you might be assigned to produce all the relevant reports and recommendations regarding just one candy bar. The chart below provides typical job responsibilities and compensation levels for major positions within the FP&A department of a large corporation. It typically takes about three to five years to make the transition from a junior to a senior financial analyst. Along the way, you might have the opportunity to showcase your skills, getting assigned the title of manager – in charge of a specific financial project, such as changing the way the company does inventory reporting, or overseeing a substantial capital expenditure project. There are various specializations available for corporate financial analysts. Some financial analysts eventually focus on handling company investments, while others apply their skills exclusively to obtaining necessary funding for growth projects. When looking at employment opportunities as a financial analyst, think about what sort of role and environment you’d be happiest and most comfortable in. Some individuals prefer a large corporation with clearly established career paths and the opportunity to gradually climb the ladder at a solidly established company. Others prefer the challenge of helping a smaller company navigate its way through a period of rapid growth, even if it requires wearing a lot more hats in terms of job responsibilities. One significant change in the industry is the increased focus on financial regulatory matters. The Sarbanes-Oxley Act of 2002 in the United States, along with other new, related legislation (and similar laws in other countries) means that the financial personnel in companies have to devote a lot more time and attention to meeting fiduciary and other regulatory obligations, such as increased reporting requirements. If you’ve got a gift for dealing with government bureaucracies – specifically, regulators – that’s a valuable skill asset in today’s corporate world. To learn more, explore our free introduction to corporate finance course. There’s a fair amount of disagreement about existing exit opportunities within the corporate finance industry. Nonetheless, there are some frequently traveled paths for professionals who have worked in financial planning and analysis. A majority of corporate financial analysts remain in the industry but pursue new challenges (and higher salaries) by moving from one company to another. Approximately 10% of corporate financial analysts eventually transition themselves into the fields of either investment bankingInvestment Banking Career PathInvestment banking career guide - plan your IB career path. Learn about investment banking salaries, how to get hired, and what to do after a career in IB. The investment banking division (IBD) helps governments, corporations, and institutions raise capital and complete mergers and acquisitions (M&A). Analysts work 100 or private equityPrivate Equity Career ProfilePrivate equity analysts & associates perform similar work as in investment banking. The job includes financial modeling, valuation, long hours & high pay. Private equity (PE) is a common career progression for investment bankers (IB). Analysts in IB often dream of “graduating” to the buy side,. Another 10% move into some other area of corporate management, such as sales and marketing or human resources. About 20% of financial analysts end up going into business for themselves, becoming private business consultants. Because the work of corporate financial analysis encompasses such a broad range of activities, and also because the work is so critically important to a company’s growth and basic financial survival, corporate financial planning and analysis (FP&A) is a career path that offers a wide variety of opportunities and higher than average compensationCompensationCompensation and salary guides for jobs in corporate finance, investment banking, equity research, FP&A, accounting, commercial banking, FMVA graduates,. With the proper skill set and a natural inclination for the work, you can carve out a very satisfying career for yourself as a corporate financial analyst. Corporate FP&A plays a major role in supporting decisions made by a company’s CEO, CFO, and executive leadership team. As such, the opportunity to add value in FP&A is huge, and having a good time in place can lead to a huge potential boost in cash business planning, including budgeting, forecastingForecasting CertificateEarn your Forecasting Certificate for careers in FP&A. This certification course will teach building a rolling 12 month cash flow forecast for FP&A analysts, cash flowCash FlowCash Flow (CF) is the increase or decrease in the amount of money a business, institution, or individual has. In finance, the term is used to describe the amount of cash (currency) that is generated or consumed in a given time period. There are many types of CF optimization, return on investmentROI Formula (Return on Investment)Return on investment (ROI formula) is a financial ratio used to calculate the benefit an investor will receive in relation to their investment cost. It is most commonly measured as net income divided by the original capital cost of the investment. The higher the ratio, the greater the benefit earned. analysis, capital structure, and ultimately the value of the entire business. We hope this has been a helpful guide to understanding the role of financial planning and analysis at a corporation, and how the FP&A team can add value to executive decision making.